When Rajinikanth called on Congress' Thirunavukkarasar this morning, it turned out that VCK leader Thol Thirumavalavan was also there. Earlier in the day, Kamal Haasan said that Makkal Needhi Maiam would not want to align with any other outfit as his party would not like to carry their taint. 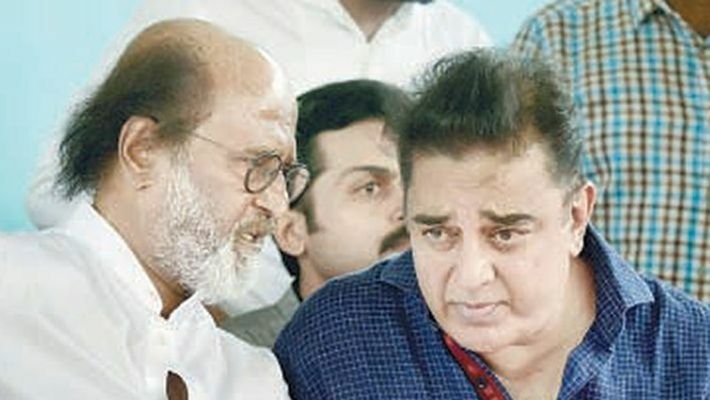 On a day when Kamal Haasan made it clear that his party would not want to tie-up with any other party, his projected arch-rival Rajinikanth met former Tamil Nadu Congress chief S Thirunavukkarasar and the leader of the pivotal Dalit outfit Viduthalai Siruthaigal Thol Thirumavalavan in Chennai. Well, this might sound dramatic and potentially earth-shattering in the political circles of Tamil Nadu. But apparently it was a mundane turn of events with nothing politically sensational at least in the case of one of the incidents. The Tamil superstar, who is keeping a low profile as far as politics is concerned, did go to the residence of S Thirunavukkarasar, the recently dislodged chief of Tamil Nadu Congress unit. Thirunavukkarasar is an old friend of Rajini's and the two share a good, personal equation. Rajinikanth's reason for visiting him, as it happened, was to personally invite him for his daughter Soundarya's wedding, which is scheduled for February 11. Soundarya is all set to marry actor and industrialist Vishagan Vanangamudi on February 11 at a wedding that is now the talk of the town. Vishagan hails from a family of staunch DMK supporters. When Rajini called on Thirunavukkarasar this morning, it turned out that Thol Thirumavalavan was also there at Thirunavukkarasar's place. With the superstar meeting the two political leaders, it instantly hit headlines. Thirunavukkarasar had incidentally got the boot as the Tamil Nadu Congress Committee (TNCC) chief after he had a hush-hush meet with Rajini in the US recently. At any rate, the Congress is not a force at all in Tamil Nadu, and Thirunavukkarasar is no longer a force in the Congress. This should have ended it all. But undaunted, news channels kept their political speculations afloat for obvious reasons. Earlier in the day, it was Kamal Haasan who hogged all the headlines with his interview to the Times of India. Kamal had recently met Rahul Gandhi in New Delhi and had claimed that he was not averse to his party Makkal Needhi Maiam having an alliance with like-minded parties. But, he did a cool volte-face today. He said that Makkal Needhi Maiam (MNM) would not want to align with any other outfit as his party would not like to carry their taint. "I cannot carry the burden of others. There shouldn't be any stain on us because of an alliance," he said. The stain he was alluding to is clearly the corruption charges against the AIADMK and the DMK. To a specific query on whether he will ally with the DMK if it were presented as an option by the Congress, Kamal shot back the idea and said, "There is an opportunity to change my state. Tamil Nadu is our focus. I don't want to change the focus for the sake of seat-sharing." Kamal also said that he was looking at candidates in the age group of 25 to 40, and the MNM was working towards fielding candidates in all the 40 parliamentary constituencies (39 in Tamil Nadu and one in Puducherry). Kamal had the biggest put-downer for DMK chief MK Stalin. To a question that Stalin apparently had a cleaner image than the AIADMK, Kamal retorted, "I disagree." Kamal's appraisal of Stalin is bound to hurt the DMK, as already it is feeling the heat that Stalin is now holding village meetings (grama sabhai), something which was popularised by Kamal in the state in recent times. Kamal, while speaking about his party's growth in Tamil Nadu, did indirectly refer to Stalin following in his footsteps. He said, "Other parties are imitating us." Kamal's confidence and the rising graph of his party would upset the DMK more. The DMK, as it is, is the frontrunner in the election stakes in Tamil Nadu. But other parties making a slow climb is sure to come as a dampener for it as the situation is still fluid. Kamal also made some enigmatic comments on Modi and the BJP. He has consistently said that he was against "saffronisation", but to a question on BJP and Modi, Kamal said, "Modi is a personality. We are not attacking personalities. The party is what we have to look at. You defeat Modi and then what? India must have a larger vision." On Rahul too, Kamal was typically phlegmatic. On whether he sees Rahul as PM, Kamal replied, "Is it one man who runs the nation?" To a follow up question on whether he was open to anyone becoming the PM, Kamal answered, "Any sensible person. We cannot look silly on the international platform." Now, do we have to read between the lines and figure out whom he implicitly had on his mind?